Little Adam’s peak is the nephew of Adam’s Peak. From the top enjoy the view over the valley, relax and connect with other travelers. From Ella Town to the foot of the mountain takes 45 minutes, and to get to the top around 15 minutes. The first 45 minutes are very pleasing as well when you pass a local village and tea plantations. Getting a more quiet spot is possible when you walk down and up (5 minutes) to the next hill. There is no actual path but you can get there with a bit of hiking. On your way back, stop at 98 Acres Resort for a coffee or tea with a view. 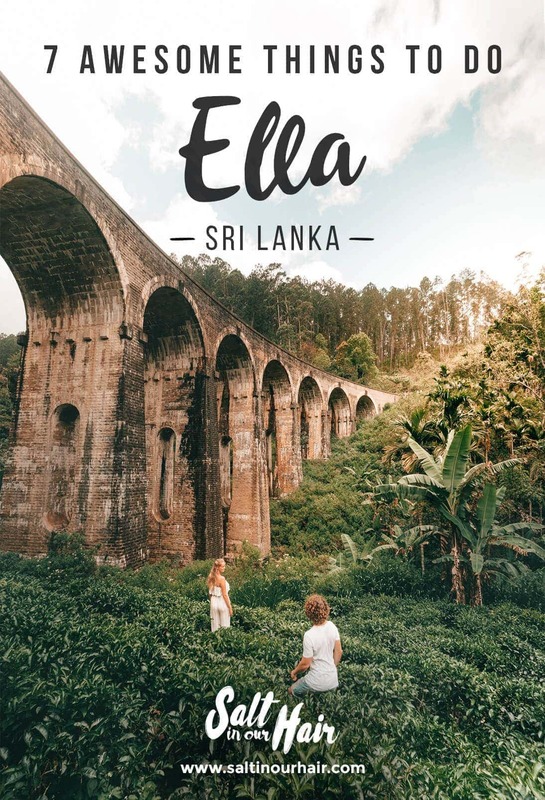 This now world-famous bridge is located just outside of Ella Town and on the same way as Little Adam’s Peak. With a small 30 minute walk through the woods, you will reach a piece of beautiful architecture hidden between lush green tea fields. This is one of the things you must do in Sri Lanka! Get a drink up in the hills at one of the cafes and wait for the train to pass. The Nine Arch Bridge is 30 meters high and is open to being visited during the whole day. The guards will just keep an eye on the safety. Lipton’s Seat in Haputale is a great morning or afternoon trip from Ella. In the morning, take a short train ride to Haputale. Once you reach the station, get a tuk-tuk which takes you up to the top where, back in 1890, mister Lipton, planted the first seeds of what now is Sri Lanka’s biggest export product, Lipton Tea. The route to the top is jaw-dropping when you see the endless stretched fields of tea. All those smiling, hard-working woman picking the best tea leaves for your tea. The tea leaf plants give the entire hillside a unique look. To visit the Diyaluma falls you will probably need the whole day, or at least if you are planning to visit it from the top. About an hour drive out of Ella is the foot of the 2nd highest waterfall in Sri Lanka. Once you have explored the foot, drive 30 minutes more to the top. Hike about 45 minutes and reach a waterfall with many natural pools on different levels. Learn about the ingredients and create some delicious Sri Lankan food with super tasty flavors. Make sure to book in advance because the Ella Spice Garden class seem to be full every day. Ready to escape a bit of the heat of the afternoon? A quick 10-minute drive from town is the Ravana Fall. It is located next to the main road so you can easily take a dip. Much easier than Diyaluma Falls. Ravana Falls has become a very popular site with both locals and foreigners stopping by to enjoy this piece of nature and a cooldown in the water. If you are up to a bigger challenge, hike to the top of Ella Rock. Little Adam’s peak is a laugh compared to this one. It takes 2 hours to hike from bottom to top. It can be done with a guide or on your own but please make sure you asked the directions from someone you trust, like your guesthouse manager. Ella has a small market on Wednesday mornings. Passara Road (Ella Super) is lined with small stalls where people are selling clothing, fresh vegetables, herbs, and fruits. Like the name says, this restaurant is very chill and it’s the most popular place in town. They serve different types of food in a great way, Detox Smoothies, Burgers, Pizza’s and the Sri Lankan Lamprais is a must-try! AK Ristoro is a bit out of the main street and has superb fresh pizza, pasta, and sushi. The owner is half Japanse so the sushi is definitely worth a try. This new Mexican place offers super tasty taco & wraps. Near Little Adam’s Peak is a super tasty Sri Lankan food restaurant. Stop here after you came back from the Nine Arch Bridge or Little Adam’s Peak. 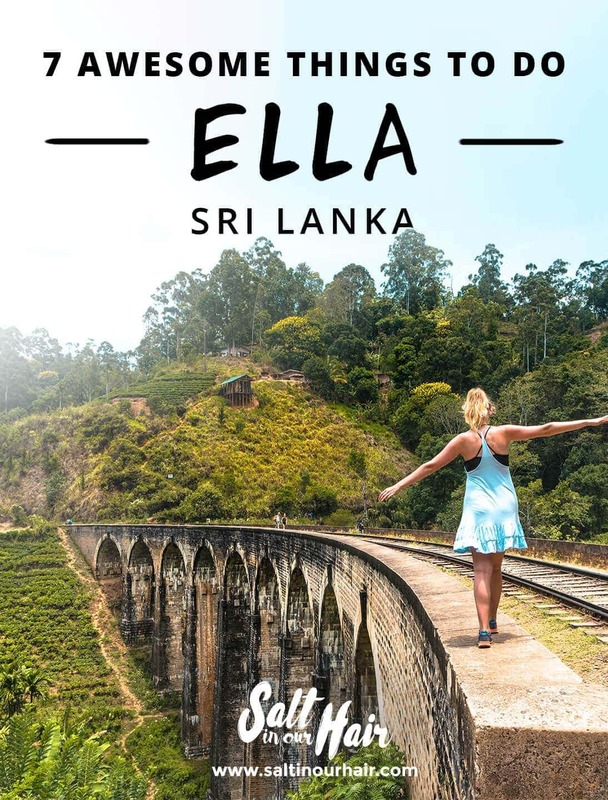 With its warm days and cool nights, the weather in Ella, Sri Lanka is quite perfect. Of course, it can’t be that green without rain. Best time to visit Ella is from January until May. If you are following one of our Sri Lanka routes you can continue your trip towards Arugam Bay, Nuwara Eliya, Kandy or Yala National Park. Arugam Bay is the hardest to reach, either share a taxi or get on the local bus to Pottuvil, which is next to Arugam Bay. We highly recommend you to visit Arugam! Ella has a lot of hostels, guesthouses, and hotels to offer but where should you stay? See all hotels in Ella under $50 a night. We stayed a few days in here and enjoyed that beautiful view. The host was great too! Starting at $25 a night. Near city centre between al the green. Starting at $25 a night.